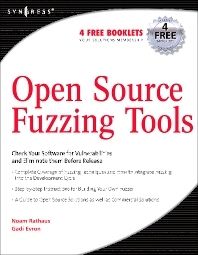 Fuzzing is often described as a “black box” software testing technique. It works by automatically feeding a program multiple input iterations in an attempt to trigger an internal error indicative of a bug, and potentially crash it. Such program errors and crashes are indicative of the existence of a security vulnerability, which can later be researched and fixed. Fuzz testing is now making a transition from a hacker-grown tool to a commercial-grade product. There are many different types of applications that can be fuzzed, many different ways they can be fuzzed, and a variety of different problems that can be uncovered. There are also problems that arise during fuzzing; when is enough enough? These issues and many others are fully explored. Fuzzing is a fast-growing field with increasing commercial interest (7 vendors unveiled fuzzing products last year). Vendors today are looking for solutions to the ever increasing threat of vulnerabilities. Fuzzing looks for these vulnerabilities automatically, before they are known, and eliminates them before release. Software developers face an increasing demand to produce secure applications---and they are looking for any information to help them do that. Security professionals of all levels and IT professionals involved in the software development process. Noam Rathaus is the co-founder and CTO of Beyond Security, a company specializing in the development of enterprise-wide security assessment technologies, vulnerability assessment-based SOCs (security operation centers) and related products. He holds an electrical engineering degree from Ben Gurion University, and has been checking the security of computer systems from the age of 13. Noam is also the editor-in-chief of SecuriTeam.com, one of the largest vulnerability databases and security portals on the Internet. He has contributed to several security-related open-source projects including an active role in the Nessus security scanner project. He has written over 150 security tests to the open source tool's vulnerability database, and also developed the first Nessus client for the Windows operating system. Noam is apparently on the hit list of several software giants after being responsible for uncovering security holes in products by vendors such as Microsoft, Macromedia, Trend Micro, and Palm. This keeps him on the run using his Nacra Catamaran, capable of speeds exceeding 14 knots for a quick getaway. Gadi Evron works for the McLean, VA-based vulnerability assessment solution vendor Beyond Security as Security Evangelist and is the chief editor of the security portal SecuriTeam. He is a known leader in the world of Internet security operations, especially regarding botnets and phishing. He is also the operations manager for the Zeroday Emergency Response Team (ZERT) and a renowned expert on corporate security and espionage threats. Previously, Gadi was Internet Security Operations Manager for the Israeli government and the manager and founder of the Israeli government’s Computer Emergency Response Team (CERT).